Last Saturday, March 10, I attended a talk by a “numerical relativist” who told us about his group’s work on simulating Einstein’s General Relativity with supercomputers to understand what happens when super-compact objects merge such as black holes and neutron stars. It was one of the talks in a series of activities hosted by CSUB’s chapter of the Society of Physics Students. Coincidentally, just a couple of days before the talk was an item in my astronomy news feed about the upcoming merger of the shortest period neutron star binary known. Let me unpack that sentence a bit. Neutron stars are the super-compressed core remnants that form in the supernova explosive deaths of high-mass stars. Basically, a giant atomic nucleus the size of a city—something with more mass than the sun compressed down to a ball that would fit between Heath Road and Comanche Drive. “Super-compressed” doesn’t quite capture how dense that is. Young neutron stars will spin very fast and produce narrow beams of radiation out of their magnetic poles. Sometimes, those beams will be pointed in our direction, so we’ll see the neutron star pulse when the beam flashes over us as the neutron star spins (and we’ll also call them “pulsars”). Some of these young neutron stars come in pairs with both beams directed our way and just a handful are close enough to each other, so they orbit each other in less than a day. One pair discovered in 1974 earned their discoverers, Russell Hulse and Joseph Taylor, the Nobel Prize in Physics when they were able to determine from the ultra-precise spins that the pair was slowly drawing closer to each other in way that could only be explained by gravitational waves carrying energy away from the pulsars as they orbit each other. It was the first very strong gravity field test of General Relativity. It was over forty years later when we had the first direct detection of gravitational waves in 2015. That was when two black holes merged. Two years later we had the first detection of two neutron stars merging and that was an even bigger deal because it also produced a burst of light to give us the first truly multi-sensory detection of an astronomical event ever in the history of astronomy. The Hulse and Taylor pulsar pair orbit each other once every 7.75 hours. The pair announced last week, PSR J1946+2052, orbit each other in just 1.88 hours. When it merges, it will produce a strong gravitational wave signal because it is only about 12,500 light years away. The merger we detected in 2017 was 130 million light years away. It will be a bit of a wait, though. Its rate of orbital decay due to the gravitational waves is such that it will merge in 46 million years. In the meantime, this close system will be able to provide other tests of General Relativity to a much higher degree of precision than we’ve been able to do before. Also, last week the Juno team released a set of papers about their spacecraft’s explorations of Jupiter. From careful measurements of subtle changes in Juno’s speed as it orbits Jupiter, they were able to create a gravity map that tells us about Jupiter’s interior. Jupiter’s cloud bands extend down much farther than we thought before—about 1900 miles. This cloud layer makes up about 1% of Jupiter’s mass. Contrast that with the tiny fraction that our atmosphere makes up Earth—less than a millionth the mass of Earth. Below the weather zone, Jupiter appears to rotate nearly as a solid body, though it is actually liquid down to the core. Beautiful infrared images of Jupiter’s polar regions are given in one of the papers. At the north pole is a central cyclone about 6000 miles across surrounded by eight smaller cyclones 2500 to 2900 miles in diameter so densely packed that their spiral arms touch each other. At the south pole is also a central cyclone but it has five smaller cyclones circling it with diameters ranging from 3500 to 4300 miles. Saturn has only a single cyclone vortex at each of its poles. Why are Jupiter’s poles so different from the banded regions nearer the equator? How are Jupiter’s polar cyclones able to be so close to each other but remain separate and distinct after seven months (and counting) of observation? Those are just a couple of the many puzzles resulting from Juno’s observations. Juno’s primary mission lasts until this July. Jupiter is the super-bright star rising about midnight among the dim stars of Libra. It’ll be highest due south around 5 AM (see the chart below). Farther east in Sagittarius you’ll see Mars and Saturn draw closer together the rest of the month as they head for their conjunction on April 2. Our spring equinox is at 9:15 a.m. Pacific Time on March 20. At that point in time, the Sun will cross over from being south of the celestial equator to being north of it as it heads toward the June solstice. For those in the southern hemisphere, March 20 marks their autumnal equinox. Eleven days later on March 31 will be the second “blue moon” of the year. 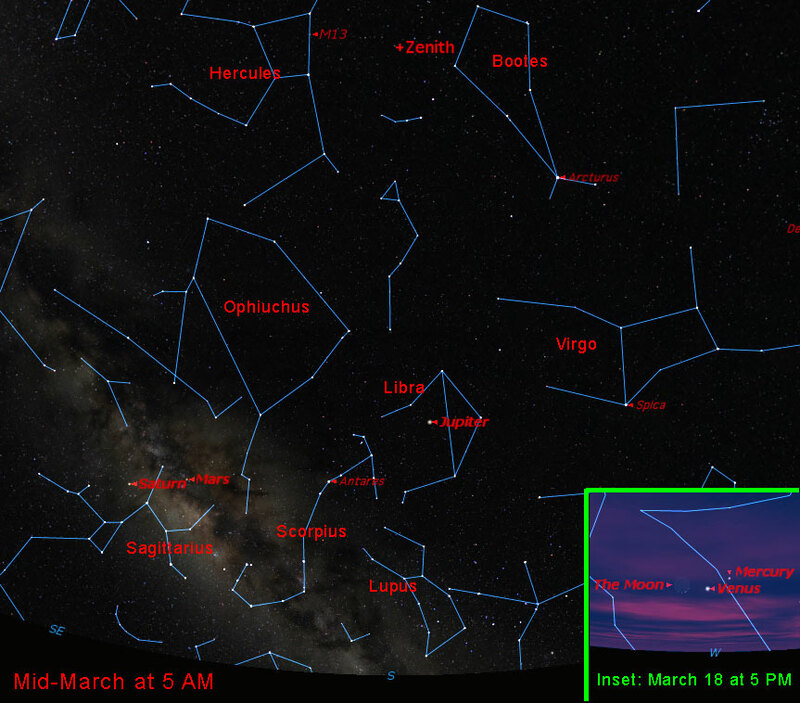 Tomorrow evening the moon will be a beautiful very thin crescent next to Venus (see the inset of the chart below).